If you have forehead acne, you aren’t alone. Quite the opposite—the forehead is part of something called the “T zone,” an area known for being particularly prone to acne in just about everyone. Even though the forehead is predisposed to acne, there are lots of ways to make it better—and worse. This article will explain the ins and outs of forehead acne, from how it happens to how to fight it, and answer some of the most popular questions about forehead acne. Increased sebaceous glands in the “T zone” make your forehead more prone to acne. The forehead is part of the T zone, a particularly acne-prone area of the face. What Is the T Zone, and Why Does It Produce More Acne? The T zone is a T-shaped area on your face, extending across your forehead, down the bridge of your nose, to the skin between your nose and your upper lip. This zone typically produces more acne than the cheeks or chin because it produces more natural skin oil (otherwise known as sebum) due to the increased number of sebaceous glands present in that zone. You have sebaceous glands all over your body that produce sebum to protect your skin, aid the wound healing process, and help moisturize skin. But the T zone has the highest concentration of sebaceous glands on the body: anywhere from 400 to 900 glands per sq. centimeter. That many glands produce more sebum than the skin needs, and the excess sebum can combine with dead skin cells to clog your pores, which often leads to acne. There are four main skin types when it comes to acne: Oily, normal, dry, and combination. These types reflect their names pretty clearly, but currently, there’s no scientific way to determine what skin type you are from home. Researchers have developed something called a Sebumeter to use in studies, but you will have to judge your skin type subjectively. One good way to tell what kind of skin type you are is to look at your U zone. The U zone is the part of your face that isn’t the T zone, essentially. It forms a U around the outside of the face, encompassing the temples, cheeks, and chin. If you have a dry skin type, your T zone might not produce much extra oil and the U zone would be dry. Those with combination skin probably have an oily T zone and a dry U zone, causing different kinds of acne in different places. If you have an oily skin type, then your U zone is probably oily along with your T zone, and you are more likely than other skin types to have forehead acne. The oil seen with oily skin types is sebum, and while excess sebum is not the sole cause for acne, it can play a big part. Based on multiple studies, dermatologists have found that participants with acne were significantly more likely to have oily skin over any other skin type. A surprising amount of products can touch your forehead throughout a typical day. When you wake up each morning, your face may have picked up extra dead skin cells and sebum that has collected on your pillowcase, which can clog pores which lead to acne. Be careful to keep hair care products away from your forehead—they can clog pores and encourage acne. Shampoos and conditioners you use in the shower can get rinsed onto your forehead and cling to pores. Gels, mousses, styling sprays, or hair sprays you might use when styling your hair can also coat your pores or touch your forehead at your hairline while you’re getting ready. These products can irritate your skin, encourage more sebum production, and clog pores, all leading to increased forehead acne. Another acne-causing agent that touches your skin all day long is your own hands and fingers. 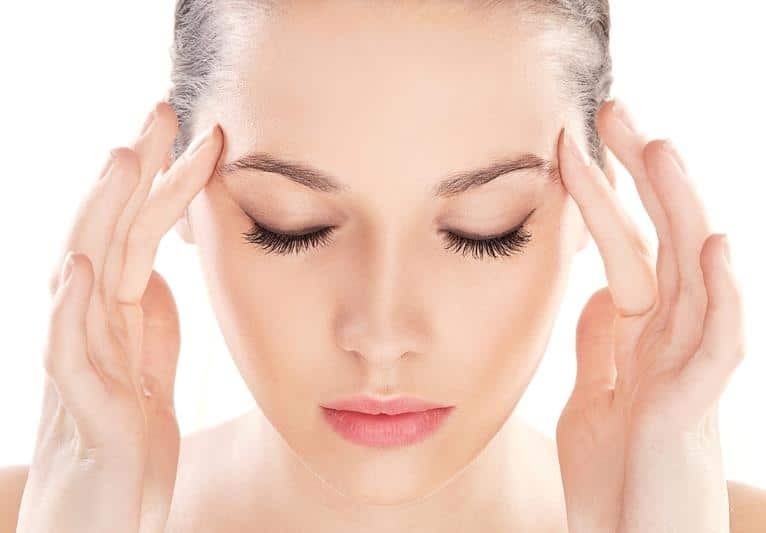 If you’re tired or stressed, you might rest your forehead on the palm of your hand or between your index finger and thumb. Restlessness or boredom often lead people to scratch, rub, or pick at their skin, especially on the face. The oils on your hands and fingers can contribute to excess sebum on the forehead, which can cause forehead acne, but it’s also important to consider what else your hands touch all day. Money, countertops, phones—these are all objects that typically have high levels of bacteria. And because you touch them all day long, you probably don’t wash your hands after each interaction. These bacteria can live on your hands and get transferred to your face. Even though acne is caused by a specific type of bacteria, called p. acnes, other bacteria can also create problems. Any bacteria on your face pose a threat to your immune system, so it tries to fight off a potential infection with the inflammation response. In addition to sebum production and p. acnes, inflammation is a primary cause of acne. Two of the best ways to prevent forehead acne are shielding it from products when showering or getting ready, and making an effort not to touch your face if you can help it. If your forehead is relatively clear, but you have acne running all along your hairline, it may be pomade acne. This is a specific type of forehead acne caused by hair products like pomade that contain oil, and it is common in people of color, especially blacks or African-Americans. If you notice this acne developing, try reducing your hair product use, or switch to a pomade with water or glycerin instead of oil. It can also be helpful to apply the product only at the center of your scalp and the ends of your hair, rather than directly at the hairline. There are several haircuts or hairdos that can contribute to forehead acne in a few different ways. One bad haircut for forehead acne is bangs. Some people, especially teenagers, get bangs to help hide forehead acne, but it may actually be making it worse. Many people don’t have to wash their hair every day, and the oils that build on our hair help protect it and keep it strong and healthy. However, those oils can transfer to your forehead if you have bangs, adding to the forehead’s naturally excessive sebum, and leading to clogged pores and acne. If you want to reduce your acne but you like your bangs, you can try washing your hair more often, or wearing your bangs pulled back a few times a week. Tight braids can pull skin tight across the forehead and close pores, increasing the likelihood of acne. Another way your hair could potentially lead to more forehead acne is if the hair is pulled too tightly. This sometimes happens with tight braids or ill-fitting toupees. When braided hair is pulled back too tightly, it can close up the pores on your forehead because the skin is being pulled tightly along with the hair. The same idea applies to toupees that are too tight; they could be pulling your forehead skin back and closing up pores, which traps sebum and bacteria that cause blackheads, whiteheads, and other acne to arise. This acne is not to be confused with friction alopecia, however. Friction alopecia is a skin condition most common in black or African-American people with tight braids. It presents with bumps that may look like acne, but this condition leads to hair loss. If you notice small bumps around your hairline and seem to be shedding more hair than normal, you should take out your braids as soon as possible. Much like the long bangs we sometimes use to hide our forehead acne, the makeup we use to cover up can actually be making things worse. This isn’t to say you can’t wear makeup—you just have to follow a few simple tips. One of the cardinal rules of makeup is to look for products that say “non-comedogenic,” “non-pore-clogging,” or “oil-free.” Heavy, oily makeup applied to an area like your forehead will only be adding to the oils already being produced there. It can further clog pores and lead to more acne to hide, so instead, look for a light, water-based foundation. Once you have a good makeup for your skin, pay attention to how you apply it. First, you’ll want to use your hands rather than a brush or sponge because those products can irritate the skin and increase sebum production. Wash your hands thoroughly, and gently apply the smallest amount of makeup necessary to get your preferred coverage. Avoid using more than one layer of foundation; the more layers of makeup you apply, the more likely it is that your pores will get clogged. 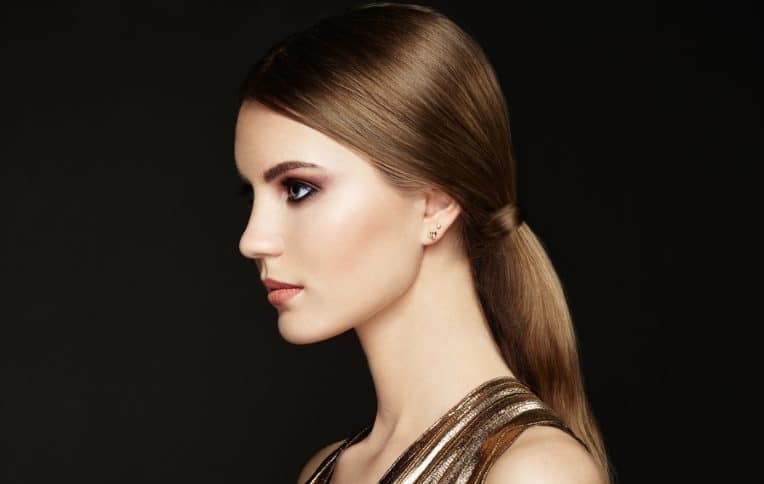 Instead of layering on foundation, make use of products like primer, powder, and concealer. A great acne-friendly makeup guide can be found here. Finally, always, always remove your makeup at the end of the day. Although it may be tempting to scrub harshly to make sure you remove it all, that is another way to irritate skin, increase sebum, and cause acne. Instead, wet your hands and rub them together with a small amount of makeup remover until you’ve made a nice lather, then gently spread the suds over your face. Let them sit for 30 seconds or so, splash your face with warm water until the suds are gone, and pat dry with a soft towel. Which Over-the-Counter Treatments Really Work? Benzoyl Peroxide: This is a common acne treatment that works by fighting acne-causing bacteria and exfoliating skin.Some of the best benzoyl peroxide products include Exposed Skincare’s Acne Serum and Clean and Clear Advantage 3-in-1 Exfoliating Cleanser. Salicylic Acid: This treatment exfoliates the skin and clears away excess sebum. It also contains anti-inflammatory properties to prevent some (not all) of the irritation caused by exfoliation. Many products with the name “toner” or “cleanser” contain salicylic acid, such as Bioré Blemish Fighting Ice Cleanser or Exposed Skincare’s Clearing Toner. Alpha Hydroxy Acids: These acids, such as glycolic acid and citric acid, exfoliate pores and stimulate new skin growth, which can help with any scarring you may have due to forehead acne. Products that have alpha hydroxyl acids include most Neutrogena products and Exposed Skincare’s Clearing Toner. Exposed Skincare combines active ingredients with natural ingredients, making it gentle and effective. Combination Treatments: Combining active ingredients can do wonders for acne, since different ingredients treat different acne-causing agents, but it can also be disastrous. Many companies combine these active ingredients at very high concentrations that dry out skin and cause more acne. Exposed Skincare combines benzoyl peroxide, salicylic acid, and other active ingredients with natural ingredients like green tea, sage extract, and aloe vera. This combination effectively treats forehead acne without irritating skin, so we can safely recommend it for all skin types. Its 3 step process and affordable cost make it a manageable option for most people, and their money-back guarantee gives you a full year to use the product to see if it works for you. Strengthened Over-the-Counter Treatments: If you’ve noticed improvement of your forehead acne with an over-the-counter treatment, but you still aren’t happy with how much acne you have, you may just need a stronger concentration.Dermatologists can provide prescription-strength benzoyl peroxide, salicylic acid, and other typical over-the-counter acne treatments. Retinoids: This is a popular prescription option because it has shown to be effective in acne that doesn’t respond well to other treatments. Retinoids are a form of concentrated vitamin A that help reduce acne by unclogging pores and reducing inflammation. They come in a variety of concentrations, from 0.01% to 0.1%, so if your prescription is causing redness or peeling, talk to your dermatologist about your options. Some common retinoids include Retin-A, Renova, and Differin (this last one is technically a retinoid-like product, but it works in much the same way). Topical Antibiotics: Most topical antibiotics prescribed for acne are now combined with other acne-fighting active ingredients like benzoyl peroxide or glycolic acid. This helps treat acne more effectively, and it prevents bacteria resistance that can occur when treated with antibiotics alone. Oral Antibiotics: If a topical treatment is not taking care of your forehead acne, or if your acne is large or cystic, a dermatologist may prescribe oral antibiotics. These affect the immune system more directly than topical agents, and the most common prescriptions are doxycycline or clindamycin. Minocycline is no longer prescribed to people under age 22 because it can lead to a blue discoloration of the teeth. If your dermatologist prescribes this and you are under age 22, ask about other antibiotic options. If you prefer natural or DIY remedies, there are a wide variety of options. Before trying any DIY treatments not mentioned here, make sure you do your research—some home remedies could actually make your forehead acne worse. Tea Tree Oil: According to the American Association of Dermatology, tea tree oil fights bacteria, exfoliates skin, and reduces inflammation. It can be an effective spot treatment for acne, but it is not recommended for use on your whole face, as it can be very drying and cause redness and irritation. If you have especially dry skin, you may want to avoid tea tree oil, but if you have normal to oily skin, you can purchase tea tree oil gels made for acne spot treatment, or you can buy diluted oil, put one drop in your palm, and use one finger to gently dab the oil onto the affected area. Honey and Lemon: This combination of home ingredients can make the perfect facial for forehead acne because honey and lemon balance each other out so well. Lemon juice can break up dead skin cells and sebum clogging your pores, and make it difficult for bacteria to survive on your skin. But it is harsh and can leave the skin without its thin layer of protective oil. Additionally, lemon is not recommended for Hispanic, black, or African American skin tones, as it could lead to uneven skin lightening. Honey, on the other hand, provides some protection to the skin, making it less sensitive, and reduces inflammation. Rather than cancelling each other out, these two ingredients work in harmony to reduce oil, acne, and redness. Just squeeze half a lemon, mix the juice with two teaspoons of honey, and apply to your face for 20 minutes, then rinse off with cold water. Could changing my diet help with my forehead acne? The current research on the relationship between diet and acne doesn’t provide us with any clear answers, but based on surveys, anecdotal data, and some research studies, reducing sugar intake may help with acne. The typical Western diet involves lots of high-glycemic foods that cause blood sugar to rise quickly and significantly. The hormones your body produces to deal with this influx of sugar can cause increased sebum production, and because your forehead has so many sebaceous glands, it can be one of the most affected areas. Try switching to wheat bread, or cutting back on soda, but remember that changes in diet will likely not solve all of your forehead acne concerns. I’m pregnant and suddenly have lots of acne on my forehead; what treatments are safe for me to try? Pregnancy acne is a very common experience; the increased hormone levels can encourage sebaceous glands to produce more oil, which often leads to more acne. Most regular acne treatments are safe for pregnant women to use, but there are two you should definitely avoid, and one to be cautious of. Definitely avoid isotretinoin, otherwise known as Accutane, Clavaris, or Amnesteem, and retinoids such as Retin-A, Renova, and Differin. These are proven teratogens that can cause serious health risks or birth defects. The research on benzoyl peroxide is less conclusive, it has not been shown to significantly increase birth defects, but it has not been proven safe for pregnancy either. If I have sensitive skin, will a hypoallergenic makeup help prevent forehead breakouts? Believe it or not, hypoallergenic makeup will not help with sensitive skin and breakouts, because the term “hypoallergenic” is not a regulated term by the FDA. This means that “hypoallergenic” can mean anything the cosmetics company wants it to mean. Typically, these makeups are no different from other products, except that sometimes they’re more expensive. First, wear makeup as little as possible. Sensitive skin reacts more to any kind of stimulation than less sensitive skin, meaning even the gentlest of makeups is likely to cause some irritation which could lead to acne. Second, make sure any makeup you do use is fragrance-free. Fragrances add unnecessary chemicals that can clog pores or irritate sensitive skin. Third, always remove your makeup at the end of the day with a gentle cleanser. You want to make sure you’ve removed all of the makeup, but you don’t want to use anything too drying or irritating. Having sensitive skin is a delicate balance, especially with persistent forehead acne, but with the right skincare, you can treat your acne while being kind to your skin. How to remove acne completely from face? There are many ways, but really it depends on the type of acne you have. For light to moderate acne vulgaris, Exposed Skin Care is our first choice for a complete skin care kit suitable for oily to normal acne-prone skin. Try Proactive, if you use it (almost) every day it works, if not the acne comes back, trust me I don't have time to do it every day because of homework, the farm, school, and a bunch of other things, it keeps coming back as a result. But, when I do it at night the next morning it is gone,(or almost). Hi, You menition "Before you cleanse the rest of your face, remove makeup from your forehead with cold cream." What cream is it that you are referring to? Thanx.